Designed by teachers to tie in with the National Curriculum, our posters come with a unique Lifetime Guarantee to warm the hearts of many a frustrated parent and teacher � we guarantee your poster will never tear or rip through normal use or we'll replace it free! No more cheap, flimsy, paper posters in the bin! Although these beautiful posters are fully recyclable there is no need to ever throw away a poster simply because it's been accidentally ripped or torn, Little Wigwam will happily replace any Everlasting Poster before you have time to pull your hair out at the needless waste! How Do I Get A Replacement Poster? Should the unthinkable happen, simply cover the P&P cost and we'll send you out a brand new poster free of charge! What About Proof Of Purchase? 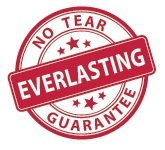 We don't hide behind silly conditions and disclaimers - no proof of purchase is required, if you have the poster you have the same Lifetime Guarantee! Simple!